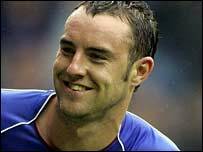 Rangers striker Kris Boyd has signed a one-year extension to his current deal. Boyd, 22, joined Rangers from Kilmarnock on a three-and-a-half-year deal in January, but his extension will keep him at the club until 2010. He netted 20 goals for his new club before the end of the season and also scored twice on his Scotland debut in the 5-1 win against Bulgaria. Rangers boss Paul Le Guen told the club's website: "He is a good player and it was important to keep him." Boyd added: "I'm delighted to have added another year to my contract. "I came back to pre-season with the attitude that I needed to impress the new management team. I think it was the same for a lot of us. "I guess I must have done something right and it's very pleasing to commit for another year. "I knew when I came to Rangers last season I had to perform to the best of my ability."